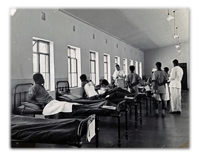 After four years war service with various Field ambulances in the East African Medical Corps, my husband was released from the Army as medical officers were urgently needed in Northern Rhodesia. The Director of Medical Services instructed him to go to Balovale in Barotseland, some distance from the border of Portuguese Angola. At the time of Eric's release we were living in a rented house at Ndola where he was looking after the troops in training at Bwana Mkubwa, once a prosperous and flourishing mine. The rains were well advanced and we knew it would be very difficult for a lorry to travel 400-500 miles without a hitch. Eric was not sure if Anthony, then 5 and a half years old and Elizabeth, 4 years old and I, could accompany him to Balovale, it would be impossible to go by road, the only way being by charter plane. After much deliberation, it was decided we should all go together and plans proceeded with this end in view. It was necessary to collect a six months supply of stores, which would go with our loads on the hired lorry. I proceeded to Brown and Guthrie's Stores and nonchalantly ordered 300lbs of flour, 200lbs of sugar, twelve cases of paraffin, that is 96 gallons, a crate of beer and other commodities in large quantities. Our car was garaged at Ndola as it would not be needed, in any c"se the retreaded tyres (a war time measure) would not last much longer. The roads at Balovale were not much more than sandy tracks. Mickey, our terrier, was to go with us but James our trusty servant felt he could not face life amongst a completely alien tribe and so he was taken on as bar boy at the Rutland Hotel, Ndola where we stayed prior to our departure. 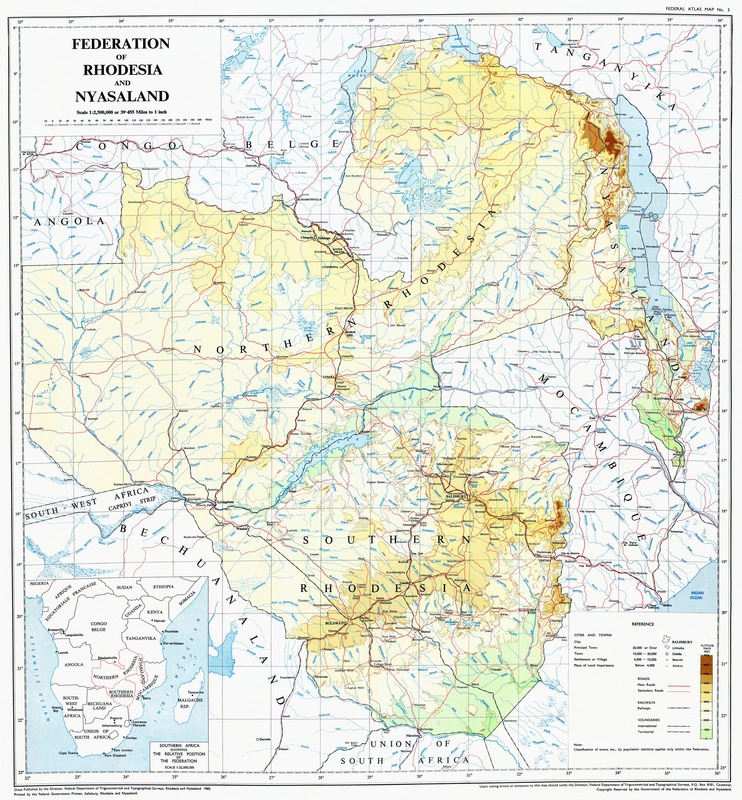 We knew very little about our future posting beyond the fact that it took three weeks to get there by barge up the Zambesi from Livingstone, or four days by road, depending on the rains and that the place could be completely isolated in the rainy season if the air strip was water logged and the roads impassable. Our journey started at Lusaka on February 10th 1944, when at 6am we boarded a six seater Rapide. One other passenger flew with us, the Director of Native Education (D.N.E. ), and then of course there was Mickey who was allowed in the cabin with us. Before starting the trip we all took Hyoscine against air sickness, thinking we should be well protected against any unpleasantness during the flight, but the elements ordained otherwise. For an hour or more we flew on and on over thickly wooded country and each minute the storm clouds grew blacker and blacker. Our pilot tried to avoid the menacing storm but was defeated and had to turn back to Lusaka and await more favourable weather conditions. This completely upset the timing of the anti-airsickness pills as when we set off again for the second time, it was too soon to give another dose. I remember how we flew over the hook of the Kafue river hoping to see hippos in the river but I do not think I cared particularly as our flight developed into a very bumpy one .After three hours we felt and looked ghastly. The D.N.E. held out very well and looked at us with embarrassed sympathy. Before we reached Balovale there were three landings on outstations, Mumbwa and Mankoya where the pilot delivered bags of mail and we feebly asked for a little boiled water to drink. At both these places the District Commissioner was on tour and the arrival of our plane was greeted by hundreds of Africans. Each time we landed we circled the station which consisted of nothing more than one or two European houses, the Boma offices, the landing strip and many native huts. I knew what to expect of Balovale. At the third outstation, Mongu, which was a Provincial Centre and where Paramount Chief Lewanike had his summer residence, the D.N.E. left the plane and we continued our journey to Balovale, where we arrived about four o'clock. Our arrival caused a stir among the population, planes were only used in emergencies or for specially chartered flights like ours for officers to take up their posts or to go on leave. As there were only five Europeans and two children on the station and the tour lasted two years or more the arrival of aircraft in those days was a novelty. Hordes of Africans surrounded us as we alighted, in the far distance we could see three white clad figures approaching the runway. Among the crowds I was astonished to see a face I recognised, the beaming face of Jonas, our old cook from Mazabuka, our first station in N. Rhodesia. His hair was a little grey but otherwise he looked just the same. He was now cook to the District Officer in Balovale. Dr W., the medical officer Eric was relieving, Miss V. the Nursing Sister and the District Officer came to greet us and we were asked to Miss V's house for tea. Over very welcome cups of tea Dr W. told us that there was as yet, no sign of our loads, all the household equipment we should need was on loan from the European Hospital and so we could move into the house immediately, this news was rather shattering, as we had very few clothes having travelled by air. All foodstuffs were lent by Dr W. who was also feeding Miss V as she had only been in Balovale a week and her loads had not yet arrived. It was ten days before our lorry turned up, by that time Dr W's stores were very low. The lorry with our loads had had a frightful journey and it was due to the sense and skill of the driver that everything arrived intact. More than once the vehicle got stuck, at one point every crate and package had to be unloaded and carried across a swamp, this included a crated refrigerator weighing over 6cwt! 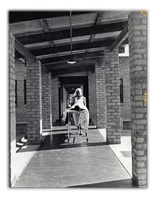 Scenically Balovale was a delightful station situated on the banks of the Zambesi, with tall spreading trees interspersed among the Boma offices, hospital and European houses, nearly all of which had thatched roofs and were built in the rondavel style. Our house was an older type with a three sided mosquito gauzed verandah and stone steps leading up to the front door. We were about seventy yards from the river which was approached by a steep narrow descending path. A narrow, winding and very sandy path wound its way high above the river bank; as we walked Africans would crouch low on the ground and clap their hands saying "Hinduka" in greeting. For all the solitude which Eric loved, the picturesque scenery, the feeling of being away from it all, there were also hardships to put up with, such as illness, difficulties with the Administration, anxieties over rabid dogs, and inadequate communications, all these things were to be experienced during our tour of Balovale, but I would not have missed our time there and wish I could go back for a brief visit to relive it all again. When we arrived the D.C., his wife and two children were on tour, when they returned Mrs V. and I were delighted for our children to have each other as company. Camilla was about the same age as Anthony, and Caroline her little sister a very advanced two year old. Nicky, eight years old, was at boarding school but came to Balovale for the holidays. We now numbered seven European adults and four children, this little community was soon joined by an eighth grown up, an entomologist, Geoffrey R.. He had no house to live in while he was not touring and had to make do with part of our verandah, partitioned off with a curtain, as we only had two bedrooms. lt must have been very trying for him, especially as no sooner was he installed he went down with severe tonsillitis. After a time he moved to the D.O's house whilst he was away on a lengthy tour of the province. It fell to my lot to supervise the cleaning of this house, after Charles W. vacated it. I was not surprised at the state it was in with my old friend Jonas in charge! Without exaggeration, a razor blade had to be used to remove the high tide marks on the bath. The arts of housekeeping in any form were quite unknown to Charles W., a remarkable person who lived only for his study of languages and ornithology, his staff could do what they liked. C.W. was a brilliant linguist, knowing no less than five native languages. We sometimes feared for his health or even his life as he would happily dissect birds and stuff them on his dining table, in this procedure some form of arsenic was used. C.W. cared very little about his appearance and was the despair of the D.C.'s wife when she had to invite him to meet an important visitor to the station. We admired him very much and I was especially grateful to him for his gentle simple explanations to my questions and interest on bird life. He also knew all the African village gossip, on tour he could talk with his carriers of folk lore, understand their stories, and tell them of the wonders of his country. I can imagine him now, a pale slight man, not over-strong, wearing a soiled worn topee, touring the villages by narrow native paths, in his macila, which is a portable hammock suspended between two poles and carried by four men, so steadily and with such perfect timing that the occupant could sit up, or write or read if he wished. I could not imagine C.W. anywhere but on a bush station. I would like to know what happened to him. Before Geoffrey R. went to live in Charles W.'s house, there was the memorable afternoon when the children and I were asked to tea. I dreaded the occasion but could not possibly refuse. I was sure the children would get dysentery or worse, knowing how C.W. lived. However we came through safely, but I was saddened by the broken teapot with the lid of a cigarette tin to replace the missing lid and the cups borrowed from the European hospital, what did he drink out of normally? Furthermore, Jonas had made an outsize sponge cake, covered in deep red icing. He must have emptied half the cochineal bottle into the icing mixture. My sympathy was probably quite wasted as C.W. was perfectly happy living this way. He always had servants of different tribes to facilitate learning several languages at once and then publishing dictionaries of these languages at his own expense. While the entomologist lived in the D.C's house Miss V. was his immediate neighbour. She had the bright idea of getting the native carpenter to make a stile between the two gardens to save G.R. a long detour to her front door. Considering the carpenter had never seen or heard of such a thing he made a very faithful replica of an English rustic stile. What his private thoughts must have been I do not know, probably that Europeans were quite mad. Charles W. was most annoyed when he returned and found the stile, he had no wish to be on sociable terms with his nearest neighbour, whatever others might feel. Miss V., always full of bright ideas, adorned the outside of her house with shiny beer bottle tops wedging them in the brick crevice and causing many a disapproving glance from the local missionaries as they passed by. The romance between the entomologist and Nursing Sister flourished and they were married sometime after we left Balovale. Monday was the most exciting day of the week, as this was mail day. The native runner, who actually rode a bicycle, would arrive from Mongu, over 100 miles away, on Sunday evening or early Monday morning with his sack of mail. This would be delivered to the D.C. and sorted, or to us if he was on tour. We would tip the contents of the bag on to the sitting room floor and excitedly extract our mail. Letters from England, new books and magazines, Anthony's correspondence lessons, mail orders from the Bulawayo shops and the Bulawayo Chronicle, nearly three weeks old. Papers and parcels reached Mongu from Livingstone, taking three weeks and letters by the weekly plane service from Lusaka. On rare occasions, mail would reach us by plane if a special charter had been arranged, this meant we too could send mail back to the capital by air, so saving much time. This makes me think of my parents puzzling over our postal address, surely they wrote, Beet, Barovale, N. Rhodesia was not enough, there must be the name of a road or nearest town! Our mail was so very important to us as it was our only link with the outside world and civilisation. 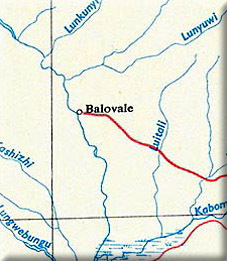 The wireless station at Balovale, manned by an African wireless operator and Post Office clerk was most erratic in behaviour. It was rare indeed for it to be able to perform the double function of sending and receiving messages, more often than not messages could be received but not sent. I do not understand the intricacies of generators etc., but I remember how a breakdown was once caused by a mouse in the generator. It was only discovered after weeks of inactivity when a wireless technician had been sent by special charter plane to put the set in order and mouse trouble was the diagnosis. It was very worrying not to be able to rely on sending and receiving telegrams, all one could do was to send a special runner with the telegram to Mongu or wait for the weekly postal runner if it was not urgent. The fee paid to the postal runner was 7s/6d. Sometimes we knew in advance that a special charter was due on a certain day, perhaps bringing someone back from leave. We looked forward to the longed for mail bag, occasionally to be bitterly disappointed as some inefficient person had forgotten to hand it to the pilot at the other end. We had our own battery-charged wireless, but of course the battery had to be recharged and this meant sending it by runner to a mission station about seventy miles distant, where they had a wind-driven charger. The runner carried the battery on his head and was paid 2s/6d for his marathon run. No fee was charged by the mission to the M.O. but other people paid 2s/6d. There could not have been many people in the area who had the slightest idea that D-Day had taken place on June 6th 1944. We did not know anything about it at the time either as our battery was being charged at the time! A lorry service delivered our dry stores from the line of rail (from Chingola on the Copper belt) most of the year round, but could not be relied upon to keep up regular journeys in the rainy season; we paid 1 and 3/4 pence per pound for freight and had stores enough to last six months or longer in case we should be cut off from regular supplies. Some months after our arrival at Balovale the rains came to an end and the level of the Zambesi river subsided revealing a small boat at the foot of our path to the river, this boat must have belonged to one of our predecessors. It was a great discovery and we immediately gave the local carpenter orders to make a pair of oars, also paddles for the children to use. The paddles turned out to be rather like giant, cooking spoons. It was delightful to row over to the opposite bank where there was a a long, sandy stretch; here the children could play and Mickey could sit up to his waist in water barking at wagtails and other birds, another of his little idiosyncrasies. We would row upstream, watching bird life on the river and bank and then enjoy an effortless journey downstream. I remember how I had the misfortune to drop our precious binoculars in the river as I was getting out of the boat, luckily the water was shallow, and I was able to fish them out quickly, but oh dear, the hours Eric had to spend taking them to pieces and drying each part and the difficulty of putting them together again! The children would try fishing with very little result. I can only recall one little fish which was dressed in a shroud and given a solemn funeral in the garden on our return from a hopeful fishing expedition. The D.C. now arranged for the prisoners to erect a palisade on the far side of the river in order to make a safe bathing pool. Long stakes were driven deep into the bed of the river, so that no crocodiles could possibly find a way in, steps and a diving board were built, also a shelter made of sticks and thatched with grass. Nearly every afternoon we rowed over for a swim, usually taking Mickey and Chips, our new puppy, given to the children by one of the hospital orderlies. Chips developed distemper when still quite young, he was miserably ill and for some time could not come with us on our river expeditions, but there was one occasion when he managed to get out of the house and began to swim across the Zambesi to reach us. Three quarters of the way across Eric fished him out of the water as he had turned back to meet him when he realised what the dog was trying to accomplish. The nicest times were when we had the pool to ourselves, quite often the D.C. and his family would be on tour, perhaps taking Miss V. with them, and we would be quite alone on the station. The D.C. had his own outboard motor but we did not envy him this acquisition, as it was much more fun to row ourselves across the river or upstream and then be carried home by the force of the current. An unforgettable river trip occurred when Sister Margaret Marie of the Santa Maria Mission near Mongu, some sixty miles downstream, visited Balovale. She really needed a dentist, but a doctor was quite able to draw teeth even if he could not fill them. 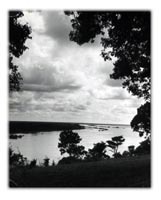 Her journey by barge to Balovale took nearly a week and each night she and her native retinue camped on the river bank. One night her boys called her from her camp and told her that there were three lions about a hundred yards from the camp fire. No one had any firearms, only native spears. "Dear God" thought Sister Margaret Marie "I come all this way to have two teeth out and will end up by being eaten by lions." While Sister Margaret Marie prayed the boys built enormous fires, and beat paraffin tins as noise and light are supposed to frighten lions. Sure enough this worked, the lions departed from whence they came, leaving the heroic little nun in peace, but there was yet another adventure in store - the Balovale river picnic arranged for her pleasure. Sister Margaret Marie, the D.C., his wife and family, Miss V., the children and I, all went in the D.C's boat upstream to a beauty spot for a picnic. The children loved making a fire to boil the kettle for tea and enjoyed themselves collecting sticks from the surrounding bush. After a lengthy picnic tea, it was time to return and we all clambered happily into the boat. After a few minutes it was apparent that all was not well and we seemed to be rolling from side to side and shipping water. Somebody grabbed a bowl and tried to bale out, the D.C. stopped the outboard motor and like a man possessed used a punting pole to get us to the shore before we turned over completely. Fortunately we reached a mud bank where we grounded and were able to wade ashore, waist deep in water and carrying the children. Sister Margaret Marie's white habit was covered in mud but she was perfectly serene throughout; each one of us was acutely aware of crocodiles and when I was not thinking of crocodiles I remembered that Miss V. had a life saving certificate. It appeared that we had embarked on our picnic with a boat already heavy with water which had not been noticed under the floor boards. African fishermen in their canoes came to our rescue and ferried us back across the river and home, where we soon changed into dry clothes and recounted our adventure to Eric. That evening we had a dinner party for Sister Margaret Marie, it was a moonlit night as she stood at our door in a fresh white habit. She looked very beautiful, I shall never forget her lovely calm face. She was merry too, thoroughly enjoying the company of other people, saying she would have to make a penance for talking so much when she returned to the mission. She came from an aristocratic family in Westphalia, Germany, and had been engaged but chose to work for God instead of marrying. Later she sent lovely hand-made toys to all the children on the station. Eric would often take us duck shooting on the river, it was a very welcome change in our diet to have duck and the children thoroughly enjoyed doing their bit in collecting the corpses floating on the water, there was sufficient air in their feathers to keep them afloat for some time. They would all be put in the bottom of the boat, some still quivering a little, Eric would have to wring their necks to finish them off. When we disembarked from the boat the children would demand to carry the ducks home, Elizabeth sensibly asking to carry "the deadest ducks!" Eric loved these trips on the river, sometimes going alone, he confessed to me once, that he had to swim to reach a duck; a highly dangerous thing to do as he could easily have been attacked by a crocodile. He was now very interested in surgery and carried out many operations at the hospital but mostly with only local anaesthetics. This was because an African orderly as an anaesthetist was not entirely reliable for long operations such as thyroids. The patients did very well but would never stay in hospital for as long as they should, sometimes getting up two days after an operation and walking back to their village. We used to go to the hospital sometimes, on one occasion Anthony noticed a poor fellow who had had both legs amputated. It made a deep impression on him. The health of the family caused a good deal of worry as our six year record of no malaria had been broken, all but Anthony succumbed to attacks and he made up for it by developing glandular fever. It was a very anxious time for Eric as the diagnosis during the first few days pointed to a much more serious illness. I shall not forget him examining Anthony's blood slide under his microscope on our verandah and the great relief when he had finished counting the red and white cells. A possible diagnosis of the serious disease leukaemia was ruled out and glandular fever was the answer. Anthony's glandular fever which was rare for a very young child in the tropics was written up and published. It was a most interesting tour for Eric, as he, most important of all, was the first to discover the sickle cell trait in Balovale and this led to lots of interesting work and publications in subsequent years. I worried almost constantly about the children's health, in spite of having a doctor as a husband. Every little headache spelt malaria, every tummy pain dysentery. At one time we thought Elizabeth had appendicitis and Eric would have to operate on her himself, she complained of severe pain, but this turned out to be an attack of dysentery, which responded quite miraculously to a new drug called Sulphaguanadine. Previously the treatment for acute dysentery was four-hourly doses of Epsom Salts. It was not unknown for a medical officer to have to do an emergency operation on a member of his family or to deliver his wife of their child if labour began before she could get to hospital. We had been told by the D.M.S. that we were to return to Balovale after leave in S.Africa; this was a great disappointment, as we hoped to be posted somewhere where Anthony could go to school. The only other alternative was to send him to boarding school, he was far too young for this as he was only six years old. We were up against one of the things one had to accept in the service, a wife and children had very little priority, if any at all, where postings were concerned. In the meantime, Anthony was enrolled with the Salisbury Correspondence School. Some families living in remote areas, for example, farmers who could not or would not send their children away to school, often educated them entirely by Correspondence School. 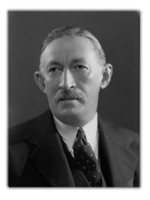 News reached Balovale that His Excellency, the Governor of N. Rhodesia, proposed visiting the station. It was rare for H.E. himself to come to such a small faraway place, the last visit by a governor had been in 1938. Usually, a deputy would be sent. We were especially interested because H.E. had just returned from England and would be able to tell us something of war conditions. The D.C. ordered buildings to be painted, paths to be cleared, grass to be cut, and a general smartening up of the station. A lunch for H.E. to meet the local missionaries was arranged. I attended this as we would not leave the children to go to the official dinner party together, not even for His Excellency, which I am sorry to say upset the D.C's wife, Penny V. We had a sundowner party for H.E. which was followed by the dinner party at the D.C.'s house. Eric had to get into evening dress for this and did not think much of it, neither did Mickey, who had never seen his master in such elegant clothes before. Eric teased the children, telling them that when the Governor's plane landed and approaches the runway the little girls must be ready to curtsey as H.E. passed them on his way to the D.C.'s house. I think they really believed him but I cannot remember if they actually curtsied I am sure H.E. would have been charmed if they had done so. I remember watching the Governor, accompanied by his aide and the Provincial Commissioner, take off in their plane at the end of the visit thinking wistfully, when will our turn come to fly back to the kind of life I really wanted, schools for the children with the companionship of many other children, a healthy climate and reliable communications. Not far from Balovale itself was the native store owned by a European storekeeper and missionary. His wife was an American, a very charming and good looking woman, she put her good health down to the fact that she spent a whole day in bed each week. The children and I were invited to tea at her home and the store barge was sent to fetch us. I think the river trip lasted less than half an hour each way but the children were thrilled with it and thought they were on a real ship. Mrs R. had our welfare very much at heart, especially Anthony. After tea which was served with cream and none of us liked it very much, (I worried in case the cream had not been boiled) she put her arm round Anthony, drawing him close and then produced a little book called "The Wordless Book". It had coloured pages, green, red, gold, black and white, as she turned each page over, she explained it's meaning to Anthony, on reaching the black page she said "Now, darling, this is your little heart, as black as sin, but if you can be Saved, it will be pure and white, like this white page". Anthony stared at her, no-one had ever told him he was so wicked and I wondered if this conversation would have some awful psychological effect, but I need not have worried, the thrill of the day was the barge trip on the river! The sect those kind hardworking missionaries in the province belonged to had a very strict way of life, smoking, dancing and drinking were absolutely taboo. One day the awful wrath of the storekeeper's wife descended on her nephew who helped at the store, as when she opened a parcel which arrived in his abscence she found to her horror 2000 cigarettes, she promptly put them all down the lavatory. Her nephew had the last word, however, by demanding the money for the cigarettes and getting it! The nephew and his wife would sometimes come to our house for a drink after dinner, first making sure that Uncle and Aunty were safely in bed! It was rather shattering to think that the Medcal Officer and his wife were not a good influence and visiting them must be kept secret. If Uncle and Aunty had known that we sometimes played Poker then I think they would have asked for our transfer immediately! Dr W. was now doing a yellow fever survey and would often return to Balovale for a few days and we would all get together for dinner and cards. I have reason to be very grateful to Dr V., not for teaching me to play poker but for help on a much more serious occasion. Eric became ill, with what at first appeared to be dysentery, but developed into a much more serious illness with severe pain and loss of blood. I was terribly anxious and in spite of being a trained nurse was at my wit's end to know what steps to take as he was getting worse and in no condition to prescribe for himself. As I sat alone at dinner, I made up my mind to find out if Dr W. was back at the station. I hurriedly wrote a note and called a boy to take it to Dr W.'s temporary headquarters, a rondavel at the European hospital. No one can imagine the relief I felt, when, after a short time he came to our house. When he saw Eric in such pain he asked me to find morphia and a syringe from Eric's medical bag, the morphia to be repeated four-hourly until the attack of acute chemical poisoning, for this is was what it was, had subsided. Before Eric became ill he had just returned from a mission station where he had been to see a missionary's wife with acute sciatica; as it was some distance away he had to spend the night there with another visitor and they had all eaten dinner together. Each one became ill but Eric was much worse than the others. It transpired that the missionary's cook had warmed a tin of mixed vegetables over direct heat, so melting the metal into the contents. I think this was one of the worst frights I experienced in Africa. It was fortunate for the missionary's wife that she did not eat the same meal. Eric was having a feud with the D.C. over a somewhat unedifying matter of donkey droppings! The water supply for the D.C's house came from the river. Donkeys would be taken down to the river's edge and the donkey boys would fill the water containers slung across the beast's backs, then they would be prodded and persuaded to climb the steep bank to make their deliveries to the D.C.'s house. Their droppings on the sandy path attracted hundreds of flies which did not please the Medical Officer, particularily as the donkeys did not deliver to us and we had to send a boy to the river for our supply which he had to carry up himself. Oh dear, I am sorry to say numerous letters passed to and fro and tempers became very frayed, the feud reached such proportions that letters ended up upon the desks of the D.M.S. in Lusaka, and the Commissioner in Mongu. The donkeys were not the only animals causing friction, Mickey our tough little terrier, developed a fondness for nipping the legs of passers by on the sandy path by the river. Sometimes an African would turn tail and run when he saw Mickey, this incensed him further and he would give chase, then maddened by the sticks and stones thrown at him he would pay the aggressor back with a tiny bite, barely enough to draw blood. After a warning by the D.C. that Eric would be prosecuted if there was another instance of Mickey biting anyone, Eric sent the D.C. a similar warning about mosquitoes breeding in the gutters of his house and wrote that he could prosecute under a certain regulation if it occurred again. Now the contestants were even! It was not easy for all to live in perfect equaminity in such a very small community. Lack of leave, trying climatic conditions and often a clash of personalities all contributed. I think we must all have had a little outstation madness, but the respective wives were unswervingly loyal to their husbands, each one thinking her husband must be right. Mickey, the cause of so much trouble, was a splendid mouse hunter. He once guided me to a mouse nest under our store room when I gave out the stores every morning. I could not understand why he sniffed so excitedly at one of my opened 100lbs flour bags. It was not until I delved deep into the bag to measure out the flour for the baking of bread that day that I discovered why he was so interested; baby mice, little pink mice inside the flour! A family visit to Chavuma Mission on the Zambesi had been arranged. This was the mission station where we sent our wireless battery to be charged, about seventy miles north of Balovale. The missionary in charge had intended to come into Balovale to attend to various affairs and then pick us up and take us to his home. He was unable to stick to this plan as a bridge en route had collapsed and so we had to be taken in the storekeeper's car as far as the bridge where Mr L. met us. It was not easy to negotiate the defunct bridge, which now consisted of a few logs thrown across the river, a tributary of the Zambesi. We managed somehow by doing a sort of tight rope walk across the shaky wooden structure. The road war horribly bumpy and the vanette was not blessed with good springs. Eric, Charles W., the D.O. who accompanied us, and Anthony all sat on boards at the back, while Elizabeth and I sat in the front with Mr L.. At one village where there was a halt for Eric to check on any sick people we watched some of the local population eat fat black tree caterpillars, Ugh! It was very hot and dusty, the month of October being the hottest time of the year but the welcome we received more than made up for any discomfort on the journey. The tea table groaned under a most sumptuous spread, which included a welcome cake which I had to cut. The Ls', American missionaries, were the most warm hearted and hospitable people and could not do enough to make us feel at home. Theirs was a big family of seven children, the eldest twins. Mr L. told us that in their early days at the mission he had perforce to deliver his wife himself as the twins were premature and the nearest and only doctor fourteen days walking distance away. The Ls' had a splendid swimming pool in the garden and had done their utmost to give their children happy times out of doors by building swings, see-saws, climbing frames etc... When we returned home we got the local carpenter to make some of these things for the children, in addition Eric designed a maze to keep them amused. Two hours after tea we sat down to supper, again a fabulous meal of cold meats and salads. To the fruit drinks a good pinch of bicarbonate of soda was added. At this meal Mrs L. in her warm, rich American accent offered me "Buttered Beets" and blushed at the pun she had made. After supper we attended a Bible reading and discourse. The children got ready for bed in their pyjamas, dressing gowns and socks in order to prevent mosquitoes biting them as they were staying up later than usual. After our talk, Elizabeth, aged four years, who had listened wide eyed asked Mr L. if he thought God was taller than the Governor of N. Rhodesia! (Then Sir John Waddington, well over six feet tall). The meeting ended with prayers, Mr L. prayed for us all, especially Eric and Charles W. in their work for the local people. All the family but the youngest daughter had been saved and great would be the rejoicing when she reached that, wonderful milestone. While staying with the Ls' the body of a young African girl was brought to the dispensary, she had been attacked by a crocodile and died of her injuries. I was amazed to see Mrs L's face beam at the news, she explained to me that the girl, only a day or two before her death had been saved and so was now sure of a place in Heaven. Not far from the Ls' house was another home where a missionary family lived but in very different circumstances, they insisted on offering us hospitality and we were invited to tea, Mrs L. having first sent over lots of her cookies as our hostess could not afford the ingredients to make them. Godliness and cleanliness did not go together in this family; I felt very sorry for the wife who was the daughter of a fisherman on Lake Eyrie, Canada, very homesick and quite worn out with child bearing. They could not afford a servant and she did all her own work. Both husband and wife had gotten the call and come to Africa to help the Ls' at Chavuma. No other life would satisfy them. Mrs L. loaded me with good things to take home, including mutton which was never seen at Balovale. In return I promised to send her butter, there was no fresh milk at Chavuma and so they had to use dried milk, Klim, (milk spelt backwards) sometimes they would order butter from the line of rail but by the time it had travelled 500 miles by lorry it was not fit for the table. I was given a little book as a parting gift entitled "The Best Things in Life". It contained a series of pictures, on the opposite page few words explained what the pictures represented. What are not the best things in life included; pleasure, success, health, wealth, wisdom, etc.... it was not until the last page that the Best Thing in Life was revealed: To Be Saved! We knew a number of the local missionaries who often came to Balovale to consult Eric. One lady missionary in particular had designed for herself a touring frock out a sort of brown material. It was most practical as it had zips at the sleeves, zips at the pockets and a zip from neck to hem at the front. Dr W. remarked that it only needed a padlock at the neck to complete the ensemble! There were some extraordinary tales about the narrow-mindedness of some members of this sect; an unmarried lady suffering from malaria refused a quinine injection direct into the buttock and insisted on being covered with a sheet. The hypodermic needle was thrust through the sheet into the buttock all because the injection was given by a male doctor! The second mission we visited was at Chitokoloki, about thirty miles south of Balovale where Mr and Mrs S. had lived for thirty years and made a delightful home. On admiring the pretty sitting room, so different from our government houses with their clumsy furniture, Mrs S. told me she was determined to make her home a haven from the workaday world outside, which she admitted often depressed her. Mrs S. had the leper colony in her care, no wonder she needed beautiful things to look at sometimes. Now thanks to a new drug some of those terrible deformities will never be seen any more. After attending morning prayers where the little school children wearing identical uniforms and identical expressions of goodness on their little faces sang rousing hymns and choruses, we were shown over the maternity unit. Here there was a forbidding looking concrete delivery table with a gulley hollowed out of the stone at the foot of the table. On the wall opposite was a list of names for boys and girls in alphabetical order. On visiting the girls dormitory we were told how they were always locked in at night. However, love laughs at locksmiths and some enterprising girls had tunnelled their way out to keep a tryst with their boyfriends. One girl who fell by the wayside was sent home to her village in disgrace and never allowed to return to the mission school. At any Roman Catholic mission these lapses were forgiven and the young mother taken back into the fold after her confinement. The older missionaries must have felt rewarded when they saw some of the young men they had helped to educate rise to responsible posts in the Zambian government. This account of our tour in Balovale would not be complete without describing the most hideous and nocturnal visitors to our homes, hyenas. These horrible animals were bold creatures, daring to come up to the very house walls in their search for food. The Nursing Sister one night heard an unusual noise at the back of her house, on investigating she saw a hyena lapping her bath water as it poured out of the waste pipe! We would often be woken by a panting or snuffling noise which turned into a whooping breathless coughing gradually becoming louder and ending in a blood curdling high-pitched scream. Eric would go out with his shotgun hoping to shoot the intruder but they were too wily for him and would slink off into the bush at his approach. These creatures were potent transmitters of rabies and it was fatal to leave dogs out after darkness fell as they would invariably get bitten and later develop rabies. Eric had the unpleasant task of shooting three rabid dogs at Balovale, two belonging to the Nursing Sister and the other to the D.C.. There were more experiences with rabid dogs awaiting us but I will not recount that now. Balovale was a bad place for scorpions, they were not very big and managed to hide themselves very cleverly in places where one could very easily come into contact with them, like the hinges of a trunk or the back of the toilet roll. We always put our bedroom slippers inside our mosquito nets at night and never put our shoes on without, shaking them first. Eric told me how a colleague of his in the Army had put a tarantula and a scorpion in a screw topped bottle to see which would be the first to be vanquished, the scorpion was the victor. One afternoon I took the children for a walk on the landing field. After walking some distance we turned to go home only to find the ground in front of us covered with red biting ants. I picked Elizabeth up and made Anthony copy me in taking long strides to avoid keeping his feet, on the ground longer than necessary, in this way we reached a native path which was free of ants but not before the ants had got into our shoes and the children's socks and bitten furiously. Never have I seen such a large area literally covered in red ants. It was not unknown that an invasion could occur and people would have to sleep with the legs of their beds standing in buckets of water. We were longing for news of leave, which was overdue. Especially as we were all feeling the strain of recurrent attacks of malaria and other ailments. I desperately wanted to get away for a complete change; Eric had given up the army leave due to him to go to Balovale. I wanted the children to run "bareheaded and barefooted on the sands in a good climate, to drink water straight from the tap, to sleep soundly at night without being caged under mosquito nets, to see trains and buses and buy toys in shops. The thought of telephones, shops etc, haunted me. Instead of making all the children's and my clothes, I dreamt of walking into a shop and buying a complete outfit of perfect fit and cut. I kept these daydreams to myself and did not worry Eric with them. The nearest I ever got to buying something ready made at Balovale was when the store keeper's wife let it be known that she had received a consignment of Chesro dresses, would I like to see them? It was the most exiting bit of news I had heard for a long time. Eric stayed with the children, while I set off for the store. The walk there passed quickly, I had to pick my way over the stepping stones of a little stream before reaching the store. My thoughts were so far away that I scarcely noticed the storm clouds close in around me. By the time I was standing in front of Mrs R's mirror, down came the rain, a tropical storm, accompanied by thunder and lightning. Fortunately it stopped in time for me to return home by nightfall and I retraced my steps carrying my brown paper parcel under my arm. On reaching the little stream I had crossed by stepping stones I found it had turned into a rushing torrent of water. There was no one insight, no stalwart Lovale to help me in my dilemma and carry me across. I took off my shoes, rolled up my skirt and tested the depth of the water. To my relief I decided it was not too deep for me to wade across, so with my precious parcel under my arm and shoes held above my head I waded across the stream , which was now a river, hoping there were no leeches or bilharzia flukes to bit me. Fortune smiled on me on this occasion and I returned safely home proudly carrying my new dress. We made our application for leave and in due course heard that we could go in January. We booked rooms at a new hotel in East London, S. Africa, where I had lived during the early part of the war. A deposit of 25 pounds was asked for which we duly sent. The wireless station was of course out of action and so everything was arranged by letter. A special charter plane was booked for us. The aerodrome was under repair and there was some doubt as to whether it would be safe for planes to use especially as we were well into the rainy season and the runway might become tii waterlogged. However, we hoped for the best and looked forward to our holiday at long last. Christmas came and went; it was difficult to find toys to give the children but necessity is the mother of invention and by the time Christmas was upon us we had mustered quite a number of gifts. We put a glass of milk and a cigarette in our sitting room fire-place for father Christmas. Of course on Christmas morning there was a cigarette stub in the ash tray and the glass of milk was drained. Anthony asked "Daddy, what happens when father Christmas dies?" Eric replied "Son Christmas takes over!" We packed trunks to send in advance to S. Africa and awaited a lorry to take them away. For weeks no lorry came through and I had visions of us spending our leave with very few clothes or buying a complete new wardrobe for each one of us. At last a lorry turned up and the first move towards leave had been made. We began to collect Lovale arts and crafts and ordered various articles of furniture to be made by the local carpenter. The Ka-onde Lunda province was renowned for its fine wood and the carpenter made a little desk for Anthony's birthday, a huge chest for Eric's books, little stools, a nestle of tables and even wooden egg cups and a toast rack. Native bows and arrows, each arrow a different shape and used for different methods of killing, axes, copies of leather-handled execution knives, beautifully made baskets, fly switches and crocodile eggs, all these were brought to the house when it was known we should be leaving Balovale. I had not given my usual order for provisions as we had enough to last us until we departed on leave with a little to spare. When a messenger came through by runner from the Santa Maria Mission saying that Dr W., who was going to relieve Eric and whom we thought was on his way to us by barge, was lying ill there with pneumonia, (probably contracted through camping out in the rains.) My first thought was what are we going to live on now? Sister Margaret Marie was nursing Dr W. and so we knew he would be very well cared for. We did not know how long it would be before we could get away. As the regular lorry service from Chingola had ceased owing to the rains and it would be months before we could get a new stock of foodstuffs, the obvious answer was to take over the supply Dr. W. had left at Balovale, so that problem was answered temporarily. As we could not send wireless messages there was no way of stopping the special charter plane and no way of cancelling our hotel booking, a letter would only reach E. London days after we were due there and so we thought we had said good-bye to our deposit. It so happened that on the day when our special charter plane turned up a missionary's wife who had that morning consulted Eric was in urgent need of a major operation and so she was able to take Eric's place on the plane. Eric begged us to take up our reservations and go to E. London without him, but I resisted as we did not know how long it would be before he could get away from Balovale. I remember Elizabeth overhearing this conversation and running to her room to get her little bag ready to take with her on the plane, which was waiting for us on the landing strip. It was just as well that I did not leave Balovale with the children as the D.M.S. wrote to say it might be three months before a relief could be sent. In the meantime our trunks were safe at Lusaka. Rain, rain and more rain, the river rose, submerging the trees on the water's edge, Balovale soon resembled a vast lake. Our boat was washed away and found, ten miles downstream. Humna Munca, the wife of Tom thumb (Anthony and Elizabeth's pet guinea pigs) died of over eating and was given a proper funeral and grave with a lttle cross in our garden. Mickey had a bad go of biliary fever and Elizabeth yet another attach 0f malaria. Eric mended his worn veldtshoen with wire; each one of us had only one pair of good shoes which we were keeping for travelling. I went on wearing my old wide brimmed felt hat, which I longed to discard. The cook asked for a few days off to bury his mother-in-law, the garden boy ditto, to bury his father, in other words leave of absence to attend a grand beer party! We settled down again and the time passed quickly, Eric completed his thesis on sicklemia and passed the lower exam in Lovale, Charles W. passed the higher. These two were the first to take these exams. We had wonderful news about Eric's brother who had now been released from his POW camp in Germany. His wife and mother were waiting in England to welcome him home. All this time our people at home had been going through untold terrors and tragedies with flying bombs and we were grumbling about mere pinpricks, but somebody had to serve on these lonely outposts and I am sure we must have been doing a useful job; being able to be together was not taken for granted; we were deeply grateful for our good fortune. As time passed and there was no further news of our relief Eric thought he had better remind the D.M.S. of our existence. Perhaps the D.M.S. thought Eric was on the verge of a breakdown, his reply was immediate, by telegram, to say a special charter would be sent on May 18th. The time came for us to pack our crates in readiness for leave as we had been told that we would not now be returning to Balovale after our holiday. So far there was no news of another doctor who would take over from Eric and we wondered if he would be able to leave the station; he was the only doctor for 1000 square miles. Noble Miss V., the Nursing Sister, said she was ready to hold the fort until the relief turned up, which was not long. On May 18th, the day we were due to leave Balovale, our plane was due at 10am and we waited in excited anticipation, all packed up and ready. I can't think what we looked like, we were all very yellow through the constant taking of Mepacrine, which had succeeded quinine as a prophylactic against malaria, and this gave a tinge to the skin more suited to men than women. I had at last got rid of my felt hat by giving it to my cook. We went on waiting and wondering, but no plane turned up. There was no question of sending a message by wireless or receiving one as by this time the generator had broken down and we knew it would be weeks before it could be replaced. The day drew to a close and we were still in Balovale arranging to spend the night in the European Hospital, praying that the next day would bring a gleaming silver Rapide to fetch us away. The following morning we rose hopefully and kept our ears pricked and our eyes open for the longed for plane. By lunch time we had given up hope. We went to Mrs R. at the store for lunch. After a gloomy meal Mrs R. insisted on making up beds for us to stay the night or a week if neccessary, as we knew that there would be another weekly plane, the usual service to Mongu next week, surely some news would come through from there by runner. As we were making up the beds I could hardly believe it when I heard a noise, on rushing to the verandah I saw a plane flying low overhead, then the pilot threw out a large parcel with a note attached which landed in the garden. We picked up our various bits and pieces and hurried along the the river path to the airstrip where the pilot had really landed and not flown away from Balovale again. The delay was fully explained, our Rapide had been on a flight to Fort Jameson in the Eastern Province, taking a VIP there on a visit, (I think he was an M.P.) he had decided to spend the night there as a party had been organised for him which he was expected to attend. The parcel thrown out of the plane as it circled the store was a collection of returned otter skins sent by the store keeper to the line of rail to be cured for his wife's fur coat! All's well that ends well; we had one night in Mongu where we left our grand little Mickey in the care of our friend Dr C. and then after difficulty in taking off, because of the sandy condition of the runway, the third attempt succeeded and we were at last, in a plane heading for Lusaka and Civilisation. Our pilot, who had shot down eleven fighters in the Battle Of Britain, gave Anthony and Elizabeth gum to chew, which was entirely new to them. It had the desired effect, which the pilot had probably hoped for, of keeping them quiet and happy throughout the pleasant and smooth early morning flight. At Lusaka we had a few days with our old friends Geoffrey and Muriel R.
How we longed to get away from Balovale then and yet now, although I may be seeing it all through rose-coloured spectacles, I wish I could go back again. If I could what thoughts would cross my mind, what sounds would I hear if I could revisit our house? The chirruping squeaks of Anthony and Elizabeth's guinea pigs, Hunca Munca and Tom Thumb, their cage resting on our enormous refrigerator crate, well out of Mickey's reach at the far end of the verandah. Elizabeth's little voice solemnly intoning make believe lessons to her dolls, or doing her best to interrupt Anthony at his Correspondence School work. She was very envious of this and longed to make a start herself. I would be assailed by the not unpleasant smell of pyrethrum as I walked from room to room; every Sunday we used to shut the house up and use a stirrup pump to spray each room thoroughly, in the hope of eradicating malaria mosquitoes. If I stood by the door of the children's bedroom I would see them sitting up in bed, listening with rapt attention to Eric's own invention, the story of the Griffin. This was stimulated in his imagination by the family crest of a griffin on his signet ring. The soft saxe blue curtains which we often sprinkled with water in an attempt to lower the room temperature, would move gently in the breeze and I would be glad the children were safe under their mosquito nets, although sleeping under a net was like having an extra covering in one's bed. I would see the cook's little girl run to the kitchen to tell her father the evening meal was ready and waiting for him, she would be wearing one of Elizabeth's old frocks, so bright and pretty when fist presented to her, but now a grey rag, having been worn day and night until it barely covered her little body. In my mind's eye I would see our fish boy, patiently waiting for me to come and buy the fresh fish he had trapped in the river, with his hand-made net. He would be sitting, with his back to the kitchen wall, his knees drawn up to his chin and his head sunk forward, dozing quietly until the cook roused him by calling his name "CHkwama"; the bundle beside him of wet sacking, would be unwrapped and we would haggle over the fish, each fish cost no more than a few pence but it would not have been correct to pay the full price asked and end negotiations quickly. If I could stand by the Zambesi again I would see the lovely malachite kingfisher skim the shimmering sunlit water and suddenly dive for a fish which he would hold in his beak for a second before swallowing, the little fish gleaming like his captor's metallic plumage. Or I might hear the noise of the cattle bellowing, an indication that the butcher was about to replenish his stocks; the cattle were made to swim the river and herded together on the far side. There was no such thing as a humane killer, the poor beasts were knocked on the head with a wooden mallet and that was that. If I could walk along a little overgrown path to the right of our house I would first come to the ruins of a fives court, built long ago for a D.C., then further on, coming into more open land, which in the rains was flooded to a depth of fifteen feet or more and confluent with the river, I would watch countless bishop birds, darting in and out and clinging to the stems of tall dry grasses, their red and black plumage making a vivid splash of colour against the dull dusty brown grass. Some memories are blurred by time, others as clear and vivid as if it were today. I hope these memory pictures will stay with me as long as I live. It is a continuing marvel to me; the ability of the human brain to retain such treasures to draw upon at will. It was all such a long time ago but feels so very close.